Apple cider vinegar has become a popular addition to many peoples diets. And with good cause. It has significant health benefits that anyone can enjoy. It is a smart decision to incorporate it into your diet on a daily basis. If you want to learn about Apple Cider Vinegar and its benefits, click here for more information. 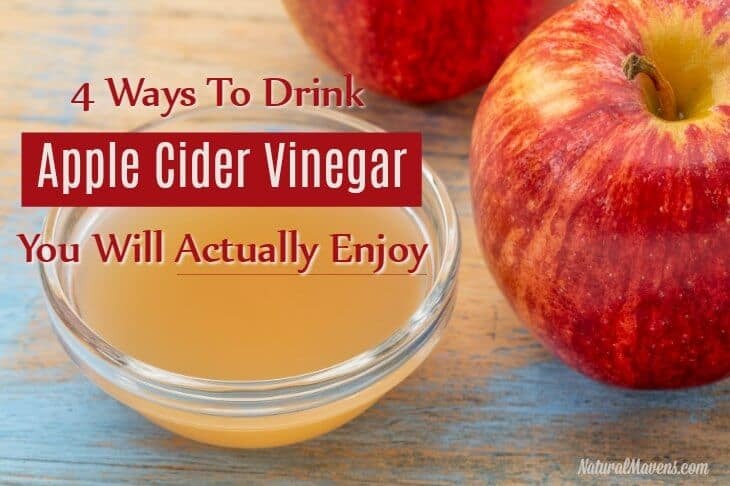 But there is one problem with apple cider vinegar – most people don’t enjoy the taste. Some people have no trouble drinking straight ‘shots’. But this is definitely not to everyone’s taste and it can also be harmful. Because apple cider vinegar is highly acidic, it can damage tooth enamel and hurt your throat. Another popular method is to drop a tablespoon or two into a glass of water. Again, the taste of this is not for everyone and I have to confess that I don’t enjoy the ‘straight up’ taste of apple cider vinegar (or ACV as it is sometimes called) at all. 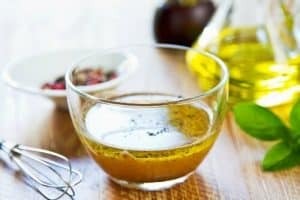 So, how can you make sure you are getting the benefits of apple cider vinegar without the bitter taste? Luckily, I’ve found a few options for how to drink apple cider vinegar without tasting it. With a little creative thinking, it is not that hard to do and the results are a lot more palatable. Below are 4 easy ways to drink apple cider vinegar and incorporate it into your daily diet, without all the nasty taste. As part of a healthy diet, you should be eating salads on a regular basis. A great mixture of greens provides lots of vitamins and nutrients along with adding fiber. But, all that leafy goodness can come undone with the wrong salad dressing. Salad dressing can add to the nutritional value of the salad when done right. 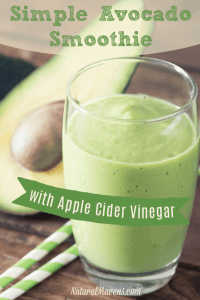 Apple cider vinegar can be used to make a great salad dressing, and it is a super easy way to enjoy its benefits. You can substitute ACV in any salad dressing recipe that calls for vinegar or lemon juice. Here is a simple recipe to try. Put all the ingredients into a jar, shake it up and use as needed. If you don’t use it all at once, store and give the jar a shake each time. Another easy way to add ACV to salads is to add a tablespoon or two to your mayonnaise. This will give it an extra kick. Read How to Choose the Best Apple Cider Vinegar. Preparing various meats such as steak or chicken often call for a marinade. Skip the store bought variety and make a homemade one instead. Use good quality ingredients and you will have a much tastier and healthier option. Most marinades have vinegar or lemon juice to help tenderize the meat. Add apple cider vinegar to the mix instead and it will give the meat a delicious taste. This is a simple marinade that can be used for beef or chicken. Whisk ingredients together in a bowl, or shake in a jar. Pour over meat and allow to marinate for minimum 1 hour before cooking. This quantity is enough for 2 lbs (1 kg) of meat. Scale the recipe up or down according to the quantity of meat. Juices prepared at home are a fresher and healthier option than pre-prepared bought juices, And you can kick that healthiness up a notch by adding a small amount of apple cider vinegar to the juice. Once you’ve juiced the fruit and/or vegetables, add a tablespoon of ACV to your glass. You won’t taste it, and if you do, just add a little less next time. Try these simple juice recipes and carrot juice recipes with a dash of apple cider vinegar. Smoothies are a great way to get fast nutrition and jump start your metabolism in the morning. One way to make them even better is to add apple cider vinegar. 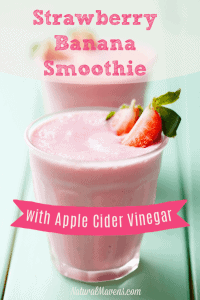 Below are some apple cider vinegar smoothie recipe options to try. Each recipe is one serve. Blend all the ingredients together and enjoy. You can easily scale them up for larger quantities. This is a super easy and fast smoothie that will give you some great antioxidants. Plus, it’s worth making just for the beautiful color! This smoothie is a great idea for people with type 2 diabetes. It has the insulin surge protection of not only the apple cider vinegar, but cinnamon as well. This is a super simple smoothie that can put a smile on any face. Even kids will like this one and it is great for gut health. A simple, creamy smoothie full of good plant based fats. Adding a couple of tablespoons of apple cider vinegar to your daily diet will bring lots of benefits as shown here. Plus, there are plenty of ways to take it, apart from straight up. 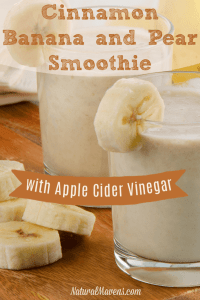 So if you are like many people who don’t like the taste of apple cider vinegar and wondering how do you make drinking apple cider vinegar taste better? Try some of the different ways listed above. 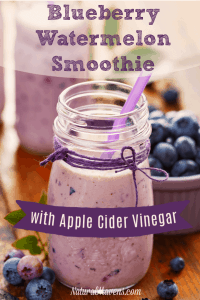 You’ll be getting your beneficial daily dose of ACV without all the nasty taste. Enjoy.